A resource that is for both librarians and the teachers they collaborate with, Reaching Every Reader, Second Edition has something for everyone. The variety of activities adds to the book...the book is well-written and arranged for ease of use. In this second edition of Reaching Every Reader, Pat Miller has updated several of her activities, including updated Web sites. She demonstrates how to pair fiction and nonfiction, an important concept for teaching reading comprehension strategies. Her focus includes collaborating and emphasizes student achievement. Her activities cover the spectrum of the elementary school curriculum and provide fun library activities to support classroom learning. She includes information on customizing the lessons and meeting local standards. For librarians working on a fixed schedule, it is important to note that many of her lessons can be completed in a single session. Necessary reproducibles are included. This is a worthy purchase for anyone looking at quick ways to put some zip in their library lessons. Now in an updated and expanded second edition, Reaching Every Reader: Instructional Strategies in the Library for Grades K-5 seeks to help educators assure their students can read well for the information age. 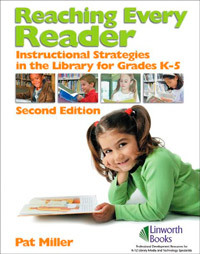 Advising teachers to create lessons that get their students into reading while still meeting educational standards, and enhanced with an index and invaluable appendixes, Reaching Every Reader: Instructional Strategies in the Library is heartily recommended to educators everywhere and deserves a place on any community library education shelf.